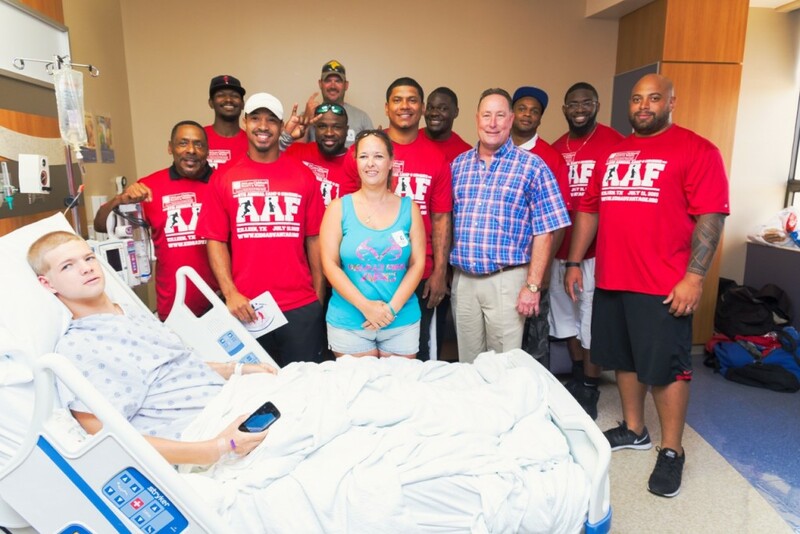 NFL players woke up July 11th, 2015 with one thing on their minds: giving back. That is exactly what they did first stopping by McLane Children’s Hospital in Temple Texas to visit kids who were in unfortunate situations. Executive Director of the Accumulative Advantage Foundation Veshell Willis shared that, “this is the “camp” for our children who cannot make it out to our football and cheer camp today. Every child deserves a little fun it was great to see the players and (Killeen) Mayor Cosper put a smile on the kids faces”. NFL players signed autographs cards from their football camp for children as they traveled room to room. Brandon Joiner former Cincinnati Bengal, local football star said, “Anything I can do for these kids to make them smile under these circumstances does more for me then it can ever do for them, this is an honor.” The Accumulative Advantage Foundation based in Killeen is proud to have these NFL players as leaders in our military communities representing the advisory board of directors of the foundation. We are truly blessed that the right men have such a large platform to give back to the communities they love. We thank you McLane Children’s Hospital for the opportunity!